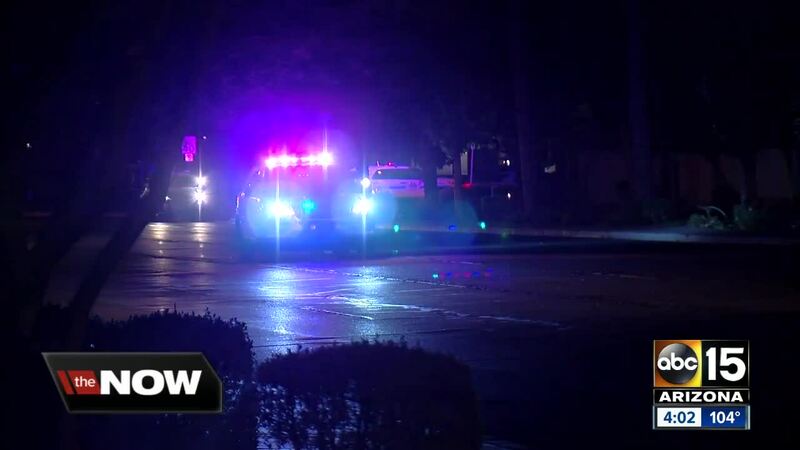 A Phoenix police vehicle and Arizona Department of Public Safety vehicle were involved in a crash during a pursuit early Tuesday morning. 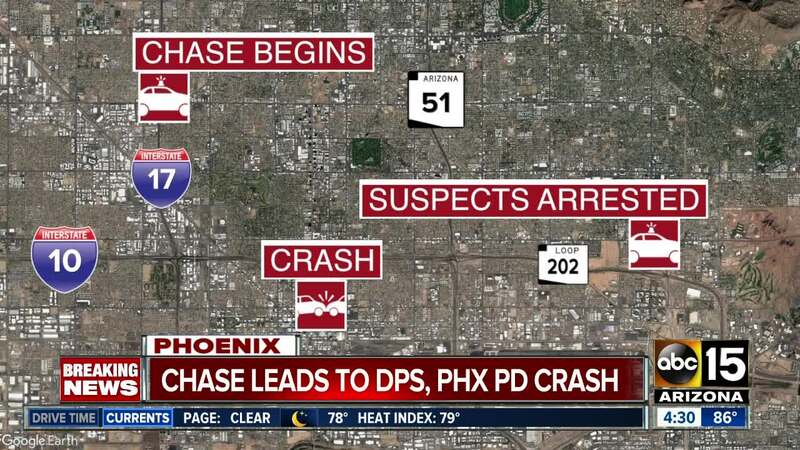 DPS told ABC15 their troopers were assisting the Phoenix Police Department with a pursuit that started near Interstate 17 and Indian School Road. One of their vehicles crashed with a Phoenix police car in downtown Phoenix near 1st Avenue and Monroe Street during the incident. No serious injuries were reported in the crash. 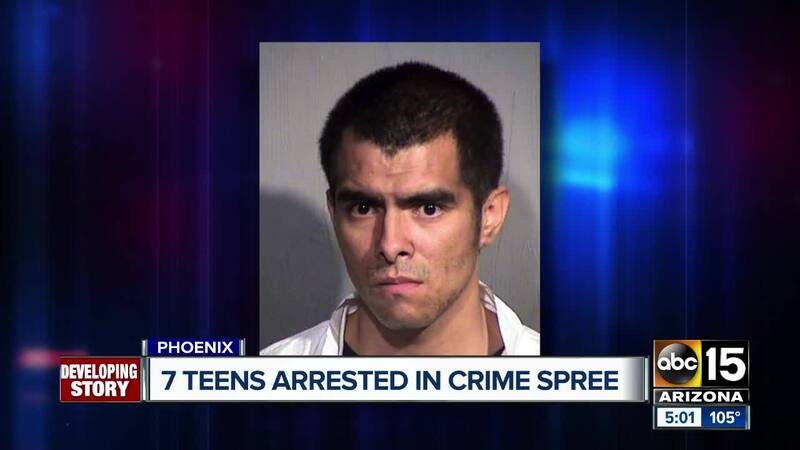 Police say the suspects, seven minors and one adult, were taken into custody near 36th Street and McDowell Road. Police said the whole incident started at 1:45 a.m. when the suspects entered a convenience store near 18th Avenue and Grant Street. One of the suspects pointed a gun at a clerk and demanded money. While this was happening, the other suspects removed cigarettes and other items from the store. The suspects fled in a Dodge Caravan. Twenty minutes later, the same suspects walked into a convenience store at 58th Avenue and Thomas Road and demanded money. The van was spotted in the area of Interstate 17 and Indian School Road. Officers and troopers pursued the suspects on the freeway and the streets in Phoenix. The chase eventually ended near 37th Street and McDowell Road where all the suspects ran from their vehicle. Officers were able to take all suspects into custody, with one juvenile suspect being bitten by a K-9. The driver of the vehicle was identified as 33-year-old Francisco Javier Sandoval. All of the suspects have been charged with several counts of Armed Robbery. The name of the adult suspect has not been released. Police believe the suspects have been involved in similar crimes in the Valley. "We don't believe this is their first experience," said Sgt. Tommy Thompson with Phoenix police. "You turn on the TV or in some of the movies, the TV series they glamorize crime. It's easy for our young people to get sucked into the belief that crime is something exciting, something romantic. In reality, these young individuals are looking at serious charges against them, including armed robbery."